I hope you all had a good weekend? Mine was fun, I went to a friends wedding on Saturday and although the weather was awful for the bride I wanted to brighten her day by making the happy couple a personalised pillow for her living room. She has some red and grey pieces dotted around the room so I thought these colours would fit in nicely. 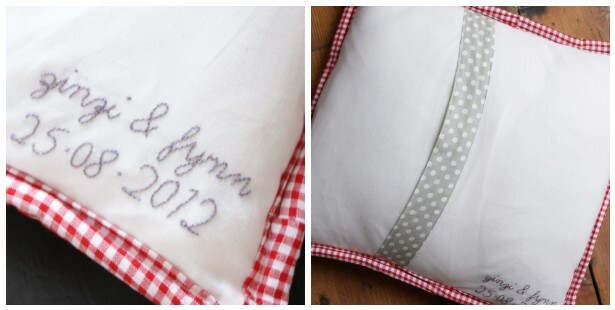 I finished it off with 'zinzi & fynn' and the wedding date embroidered to the back of the pillow, so they will always have a memento of the big day :) I haven't used this chevron quilting effect before, but I will definately be trying it again - so cute! p.s. apologies for the rubbish photos, I took them in about five minutes flat before we dashed off!! AS always Jesse beautifully done. The couple must have surely been very pleased with your gift-. What a wonderful gift! You did a great job and I'm sure they will treasure it for years and years to come. Bravissima, è molto bello, sicuramente un regalo gradito. 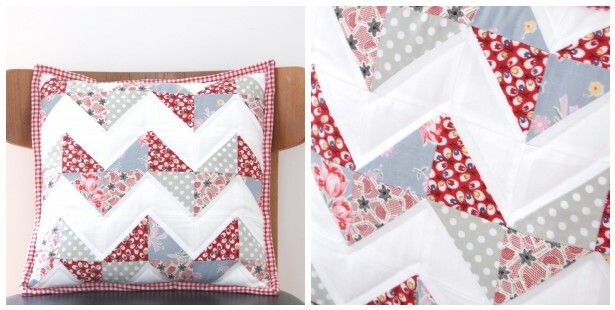 Beautiful pillow, pretty fabrics! The embroidery makes it extra special! Beautiful present for a wedding! I'm sure it'll be on a confortable sofa in their home, giving colour and beauty.